To honor what would be Roger's 72nd birthday, a celebration of his life was held on Google+ Hangouts today. Hosted by Chaz Ebert, participants in this discussion included esteemed filmmakers Werner Herzog, Steve James John Singleton and Alan Polsky, along with RogerEbert.com editor-in-chief Matt Zoller Seitz, film critics Anne Thompson, Sam Fragoso, Ali Arikan and Kartina Richardson, and web designer Josh Golden. By glancing at the multiplicity of voices represented above, it's clear that Roger's impact on people was far and wide. During the nearly hour-long conversation each individual elegantly explained how Roger affected their lives in one way or another. For some it was a mere email of encouragement, for others it was a positive review of their movie. Whatever the individual scenario may have been, Roger's appeal was universal. In case you missed the event this afternoon, fear not, we've embedded the video for you enjoyment below. A special thanks to the people at Google for setting this event up and Youtube critic Chris Stuckmann for supporting the special day. 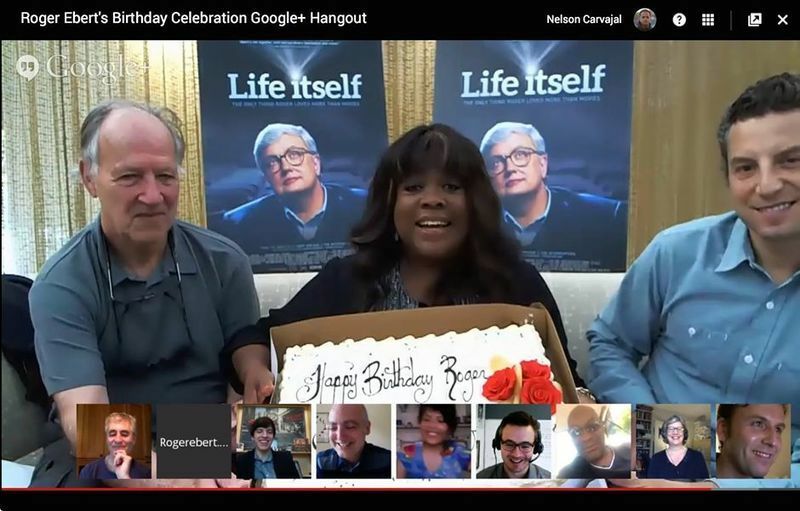 Lastly, all of those who joined us during our Google+ Hangout session had the opportunity to win tickets to one of the three premiers of Life Itself. Those selected to attend are listed below. Congratulations to the winners. 1.) What was the last full movie review Roger wrote before he passed away? 2.) Which famous musician shares a birthday with Roger? 3.) What was the reptile that engaged with Nicolas Cage from the movie "Bad Lieutenant." For more birthday articles, see Roger's Birthday: Table of Contents.